Finally, my collection is complete! A while back, I swatched Addiction from Urban Decay. I fawned like a fangirl over it, then I found a few dupes. 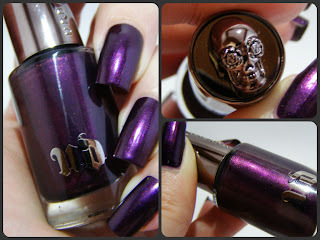 None of this quenched my need for Vice, the second color in the "collection" this year from Urban Decay. 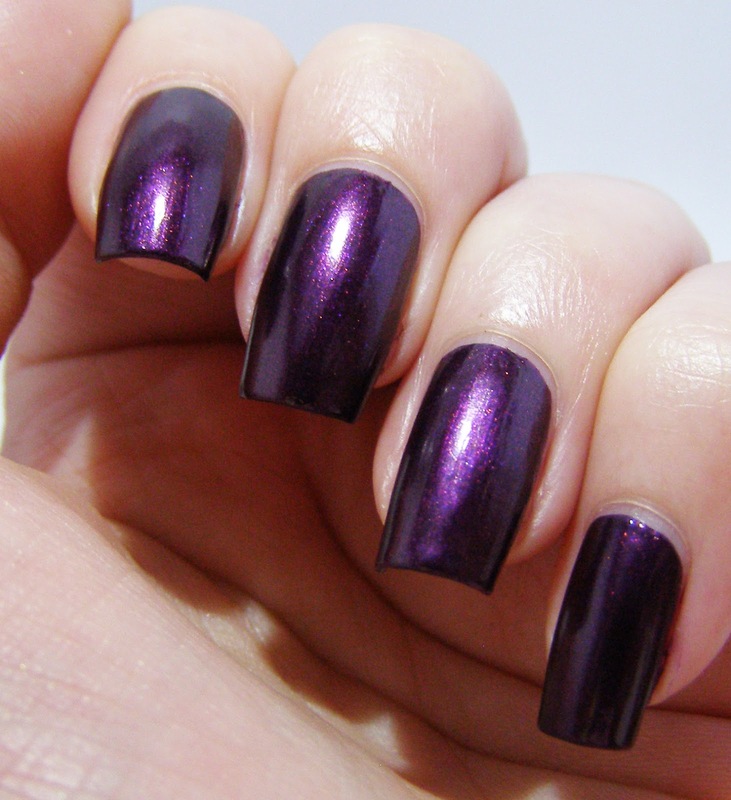 It's a nice, purply-wine kind of color, packed with shimmery bits just like Addiction. I was worried it would resemble every other medium sparkly purple, but thankfully it doesn't. It is definitely fairly unique in my collection...which isn't saying much considering I have less than 20 purples. It's just not a favorite color of mine. 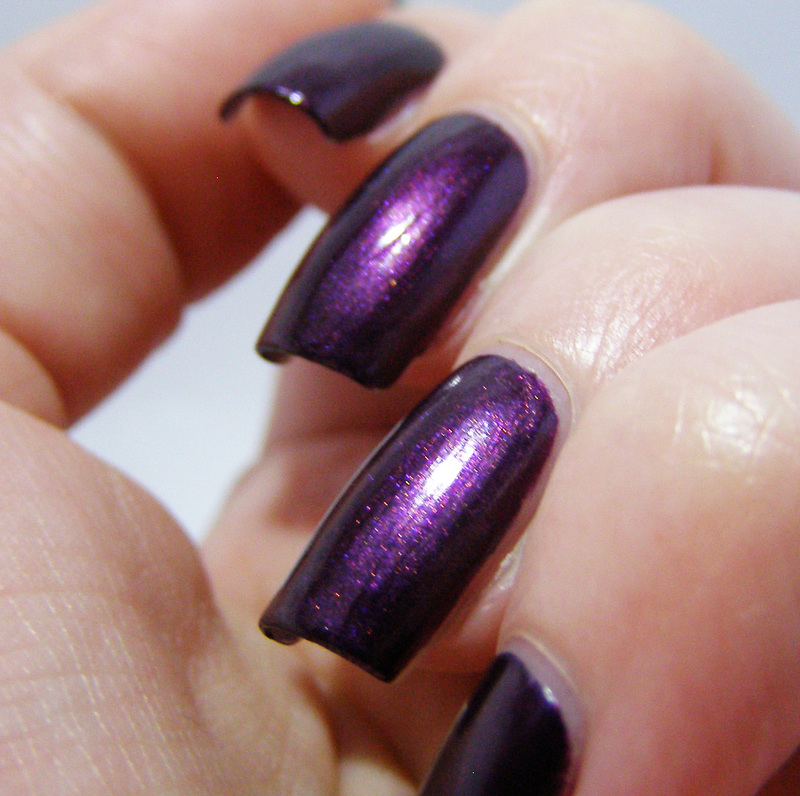 I actually like this one, but I think it's that almost eggplant depth. It's got problems, or at least this bottle does. It is terrifyingly lumpy. Like...weird chunks of stuff in there. Before I use it again, I will definitely be thinning it a bit. That is something I have never had to do with a brand new polish. Because it's so thick, there were tons of streaks, which made getting a smooth coat tricky. That, coupled with the disappointing lack of gloss to the finished product, makes a good topcoat a must. All in all, I can't recommend this polish. Unless you are a fangirl like me, go ahead and pass. Too bad, really, 'cuz it's gorgeous! it is pretty...but it doesn't seem as special as I was hoping. And the formula...maybe I got a bad bottle?